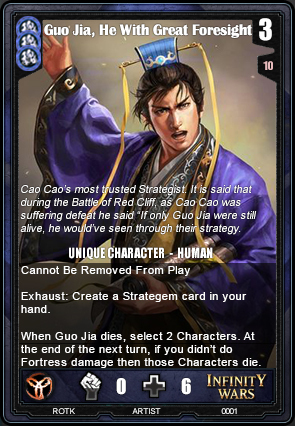 Background / Cao Cao's army was renowned for their swiftness. They'd always appear on the battlefield faster than his opponents had planned, decimating them. He was the type of person who would sacrifice one of his men if it meant motivating all the others. Background / Here is a quote from the novel during Cao Cao's siege against Lu Bu. Quote from the novel - Cao Cao's forces besieged the city for months but they still could not conquer it because Lü Bu and his men resisted firmly. By then, Cao Cao's troops were tired and weary of battle, so Cao intended to withdraw his forces. However, Guo Jia and Xun You told Cao Cao, "Lü Bu is courageous but foolhardy. His army's morale is low because he has already lost three battles. The troops look up to their commander. If their commander shows any sign of weakness, the men will lose their fighting spirit. Lü Bu may have Chen Gong as an intelligent advisor but the latter's strategies always come late. Now, we should take advantage of this situation, when the morale of Lü Bu's forces is low and when Chen Gong has yet to think of a solution, to press on a fierce attack and we will achieve victory." Cao Cao heeded their advice and directed the waters of the Yi (沂) and Si rivers to flood Xiapi, resulting in his triumph over Lü Bu. 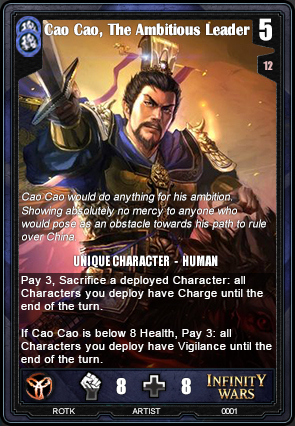 Background / Xu Chu was Cao Cao's bodyguard. 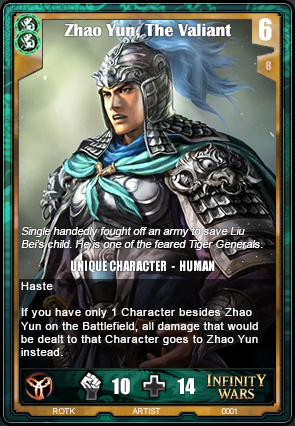 He saved Cao Cao's life multiple times and fought one of the monster Tiger Generals, Ma Chao, without even using his armor. 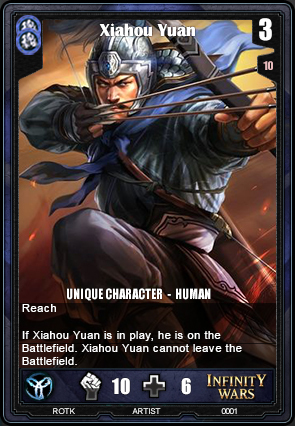 Background / Xiahou Dun is one of Cao Cao's most trusted generals. 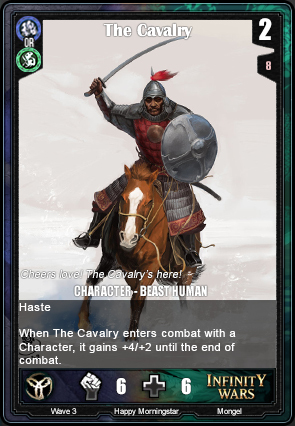 As his flavour text says, he was once shot in the eye with an arrow on the battlefield. He then proceeded to take it out, eat his eyeball and then give a battle cry which motivated his troops. In that same battle he killed the man who shot the arrow. 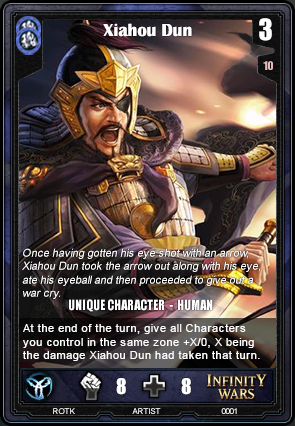 Background / Xiahou Yuan was known for the swift movements of his units in battle, and he often took his enemies by surprise. 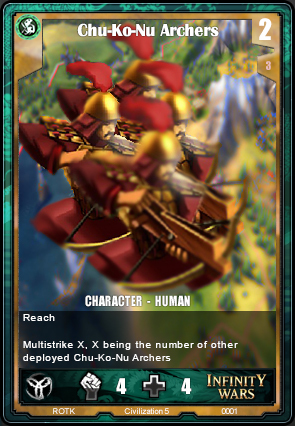 There was a saying in Cao Cao's army to describe this: "Xiahou Yuan, the Colonel Who Arranges the Army, travels 500 li in three days and 1,000 li in six days." - Sanguozhi vol. 9. 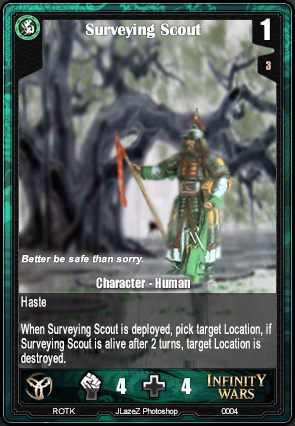 Background / Wei was known for the swift movements of their army. This was thanks to the experience they gathered from their many battles and their military horses. 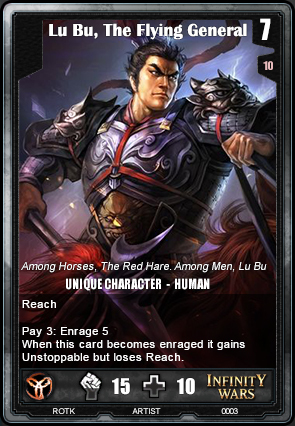 Background / Both Wei and Shu had good horseman while Wu was skilled in the water. 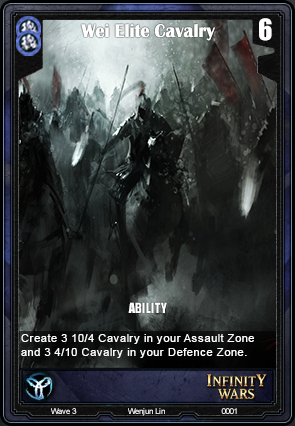 I thought it'd be fitting for the cavalry to be a duel faction card. Background / Even though he had royal blood, Liu Bei started in humble beginnings as a shoemaker. He saw the struggles that his Dynasty was in and the corruption that was taking place and decided to do something about it. 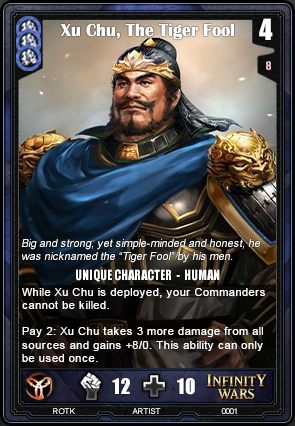 One day he met Guan Yu and Zhang Fei who shared his ambition and together they decided to become sworn brothers. 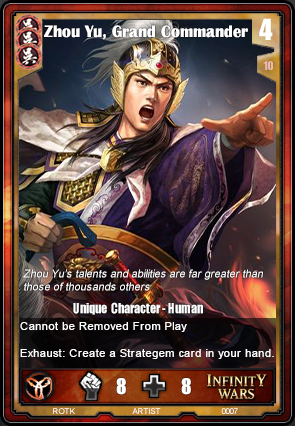 Background / Zhuge Liang was known as the greatest mind in the Three Kingdoms. Skilled in geography, engineering, politics and strategy. His intellect knew no bounds. 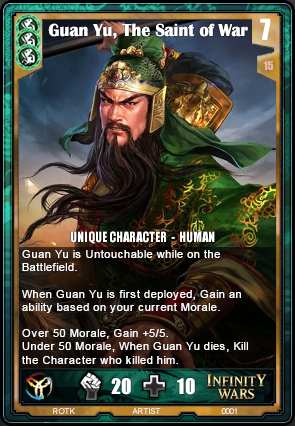 Background / Guan Yu is renowned as one of the strongest fighters in the Three Kingdoms. He defeated the strongest of opponents in 1 on 1 duels. He was also known for his unwavering loyalty, which was so great that people started to worship him as the deity for loyalty, even to this day. 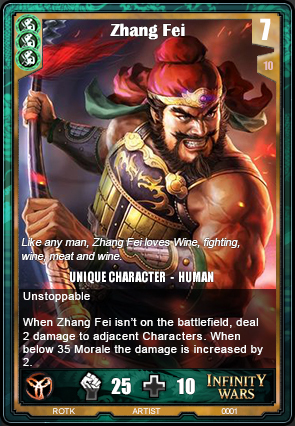 Background / Zhang Fei is one of the Three Sworn Brothers along with Liu Bei and Guan Yu. He was a monster on the battlefield with his enormous strength, however though when he wasn't on the battlefield his drinking habits got the better of him and he would often attack his own men. Background / Most known for his valiance, Zhao Yun once single handedly fought 100 men to save Liu Bei's child. In that same battle he killed Cao Cao's sword bearer and stole Cao Cao's "Blue Sword" which was known to cut through steel. 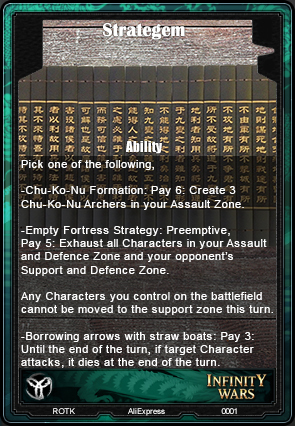 Background / Chu-Ko-Nu or Zhuge Nu aka The Repeating Crossbow was a weapon made in ancient China. Zhuge Liang made improvements to the existing model which was so successful that the weapon was named after him. In Chinese the weapon's name literally translates to" Zhuge Liang's Crossbow". Background / I searched up Chu-Ko-Nu images and came across this guy. I then photoshopped him into a background and BOOM. Surveying Scout. 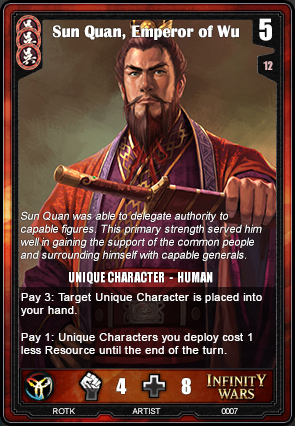 Background / One of my favourite of many quotes about Sun Quan. Quote from the novel - Sun Quan recognized how his head secretary Lü Yi (呂壹) had been falsely accusing his officials, and had Lü executed; he then further confirmed his trust in the high-level officials by personally writing an emotional letter to Zhuge Jin, Bu Zhi, Zhu Ran, and Lü Dai, blaming himself for the recent problems with his administration while urging them to speak out honestly whenever they saw faults in him. 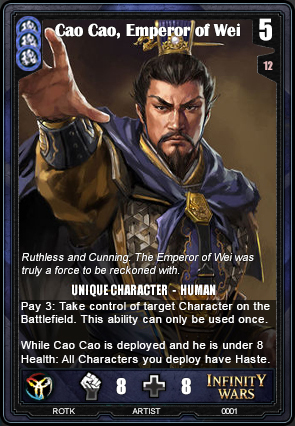 Background / The first Grand Commander for Wu. 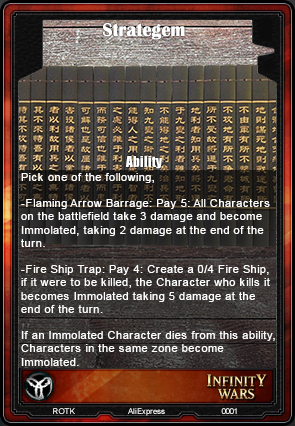 His fire attack strategy obliterated Cao Cao's navy in what would be the most important battle in the Three Kingdom era, The battle of Red Cliff. 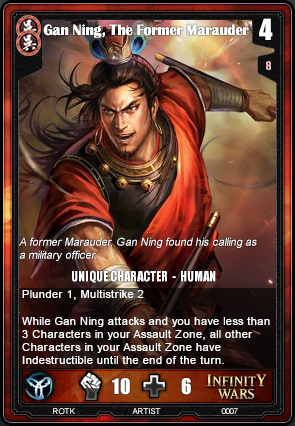 Background / Gan Ning was known as one of the strongest fighters in Wu. Even though he was a former pirate, Wu still accepted him because of his abilities. This is where he found his calling and dedicated his life to Wu. Quote from the novel - Before the raid, Ling Tong led 3,000 troops to engage the enemy and duelled with Zhang Liao before he was ordered to retreat. When Gan Ning saw that, he told Sun Quan, "Tonight I'll bring only 100 men to raid Cao Cao's camp. If I lose a single soldier, this will not count as one of my contributions." That night, he led 100 horsemen to attack Cao Cao's camp and all of them returned alive after inflicting damage and casualties on the enemy. Background / The longest river in asia and 3rd longest in the world. This was where the Battle of Chibi was fought. 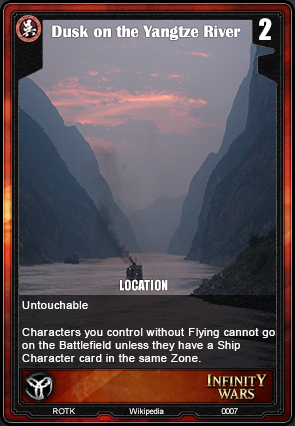 Background / Wu was known for their skills in the water thanks to the the rivers running through their territory. 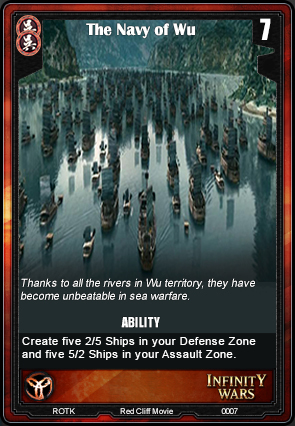 If Wei was known as the strongest on the land then Wu was the strongest on the sea. Background / Although unskilled in leading his troops, Lu Bu was the strongest on the battlefield, once taking on Liu Bei, Guan Yu and Zhang Fei in a 1 on 3 fight. His archery was also to be feared. Capable of making pin point shots thought to be impossible for man. Background / Once upon a time, there was a minister who used his power for his own greed. 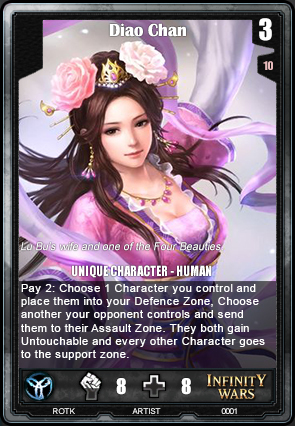 Diao Chan was used to charm the minister into marrying her but during that time she also had a relation with Lu Bu. Lu Bu, upon hearing of the minister and Diao Chan's wedding, thought she was being forced into the marriage. To free her from the marriage Lu Bu decided to kill his lord and flee with Diao Chan. 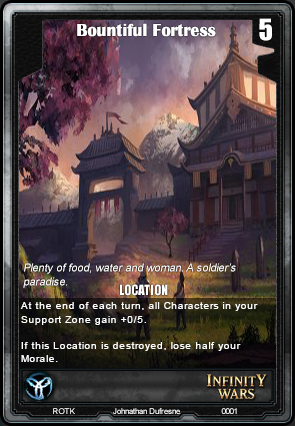 Background / I was talking to Benionin about locations and that inspired me to add some more location cards into this Wave. Feel free to leave suggestions for cards. Even if you aren't familiar with the story. Tullio and Ju-Lin carry Infinity Wars. Cao Cao: 4 resources base cost i reckon, also why cannot undo? Oh well it's more for lore than anything else. It's just to capture Cao Cao's arrogance. 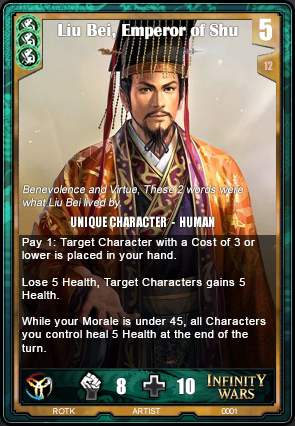 Zhuge Liang's mechanic is interesting, but I expected more mind games from the man who opened up an undefended city's gates to the enemy army to make their commander think it was a trap and retreat. ......You're totally right. Zhuge Liang deserves better than this. Okay done Wave 1 for now. Wave 2 is gonna have more Locations, Abilities and non unique Characters. 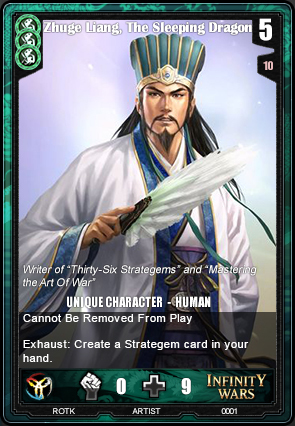 Does Zhuge Liang only have the one strategem? Makes sense. You could always pull an Alpha One and "Pay X: activate an ability"
I made a new version for Wave 2. I couldn't fit what I wanted inside his text box so I made it so that for a high cost he'll create a specific "Strategem" card in your hand. 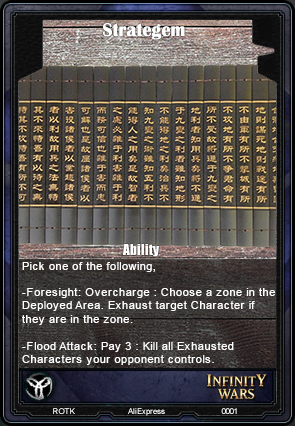 If your opponent can guess which Zone the ability will target then they can dodge it and you wasted your resources but if they get hit. GG. It'll be similar to Mass Death but hopefully more versatile since you can select the zone and effect before creating it. Edit - I pressed remove instead of modify so now it looks like you're crazy and talking to yourself. Sorry. Edit 2 - Thanks on the Alpha One recommendation. It helped me word the ability better. Wave 2 is here. Fleshing out some of the factions. Sorry for the Civ 5 photoshop. Really interesting stuff here. Nice work! Wave 3 is here BOYS. This ones for you Benionin, my number 2 fan. I think my slight OCD went out of control for a moment. 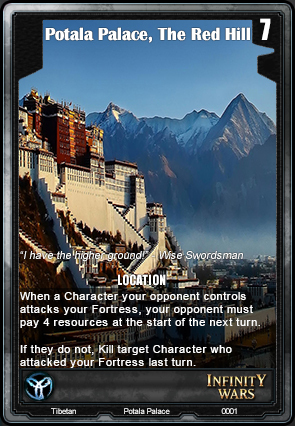 I remade most of the cards using a new template I made for each faction. I didn't NEED to but again, OCD WENT CRAY CRAY.